We just returned from a 3-day backcountry skills workshop on Flower Ridge in Strathcona Park. Our main objectives were to hike into the subalpine, practice backpacking skills, focus on wilderness navigation, and enjoy some amazing views. The hot temperatures almost completely melted off the lingering snowpack…and out came the bugs! Weather: Day 1, clear, no precipitation, calm. Day 2, clear, no precipitation, calm. Day 3, clear, no precipitation, calm. High temperature 28ºC. Low temperature 8ºC. Pressure steady 1020 hPa. Wildlife: We saw several Vancouver Island Ptarmigan in their full summer plumage, one sighting with a few babies. There were several squirrels, frogs, crickets, butterflies, many mosquitos, and an insane amount of black flies. We heard Pacific wren, varied thrushes, and hermit thrushes. We did not see any large mammals or any sign of them, other than a few deer tracks. The bigger mammals were smarter than us, preferring the shaded valley bottoms, where there is way more food and water, cooler temperatures, and less aggressive bugs! Hazards: Exposure to a high overhead sun on cloudless days. There is not much shade while hiking the 8 km length of the ridge above 1200 m. Tarns were drying up quickly. If the hot and dry keeps up, lack of water may become an issue. Bug pressure was intense after the hatch! Notes: This trip was a follow up to our reconnaissance up the ridge on May 5. The snowpack lingered almost a full month beyond what we had anticipated. We timed this trip perfectly with the snowpack almost disappearing. However, the bugs timed their hatch perfectly to our arrival. Bring lots of bug spray and consider bringing a full head net too! There are no BC Parks permits required for recreational hiking and/or camping on Flower Ridge. However, we witnessed evidence of dozens of illegal fire pits, dogs running free and swimming in the limited water sources, and very poor human waste management. We believe BC Parks ought to consider adding this zone to the Core Area Special Regulations (camping only permitted at designated campsites, no campfires allowed, pets must be on a leash and under control at all times, and staying off revegetated areas). A stricter land management plan, a registration system, and backcountry user fees, may help slow down the impact of increased traffic to this fragile subalpine ecosystem. Access to the trailhead is via the Buttle Lake Parkway (Westmin Mine Road) 30 km south of Buttle Narrows and the Highway 28 junction. There is excellent vehicle accessible camping at Ralph River campground, 3.7 km north of the trailhead. The vehicle accessible camping fee is $20 per party / night. There are 75 sites, all FCFS with some reservable online through Discover Camping from May 11 to Sep 2. The campground is closed Nov 1 to Mar 31. The campground was recently updated with brand new amenities, including shiny new pit toilets. The Flower Ridge Trail is one of Strathcona Park’s most efficient routes into the subalpine. The old trail has a gentle gradient rising 1100 m over 8 km. Once on top of the ridge, hikers are rewarded with sweeping views of the surrounding mountains and Buttle Lake below. 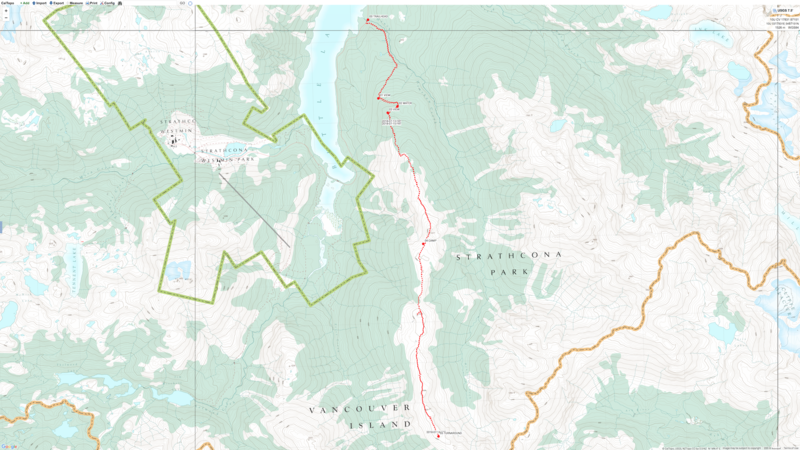 The Flower Ridge Trail is an important access/egress of several multi-day expeditions in the East and South Strathcona zones. Check out Exploring Strathcona Park by Philip Stone for more detailed route information and a lifetime of ideas for backcountry treks in Strathcona Park.